・Original Nomex honeycomb has been replaced with solid corrugated laminate structure (Fig. 4). 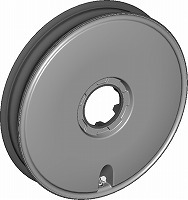 ・Rim is made as a one disk monocoque. ・Light weight, high transmission efficiency using a solid coupling. 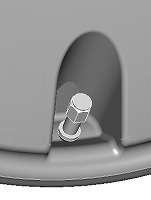 ・Wheel is mounted on Mitsuba/NGM DD Motor Center Lock hub. Please read the text below prior to using or purchasing a wheel from us. 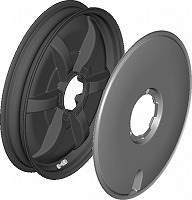 This wheel is wide rim method which aim for low rolling resistance. It is easier to build a wheel if you spread the bead by tie the tread side.